You are here: Home>People>Hemel Hempstead born and bred - and proud of it! The houses now in Bury Hill were built at the beginning of the 1930s, and my parents, with my brother and sister, moved into number 42 just after Mr Green, a local builder, had completed them. I was born in 1932 and delivered by Annie Barlow, the District Midwife who lived at 50 Bury Hill. As a small boy I can remember looking out of our back bedroom window to watch ‘Puffing Annie’ the local train starting off on its journey from Heath Park Halt, which was between Cornerhall Road and Station Road bridges. 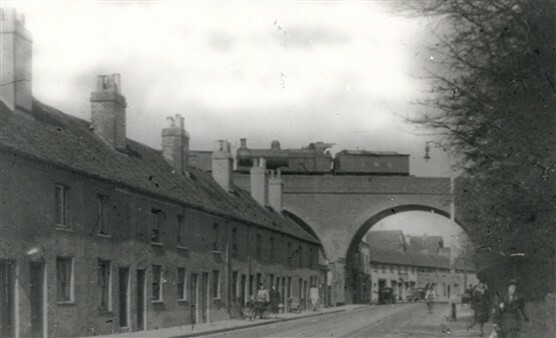 It would set off across the embankment on the moor, over the bridge at the end of Marlowes, through Paradise, along behind West Herts Hospital (where Windsor and Verulamium wings are now), under Hillfield Road Bridge to Midland Railway Station. 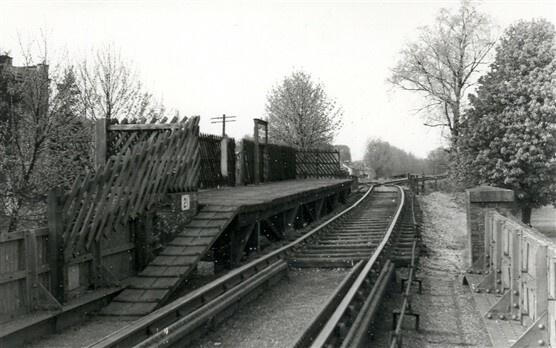 I knew when the train had stopped as there was a continual stream of smoke from the engine until ‘Puffing Annie’ set off again under Adeyfield Bridge, along the embankment and over Highfield Lane Bridge (now Queensway), and on to Cupid Green where it would disappear along the Nicky Line to Harpenden. Further down Bury Hill was a row of old cottages where my friend Patrick lived. Behind the cottages was a large back yard with outside toilets down one side and coal sheds along the other side of the yard, and on the boundary wall at the end hung large tin baths. On Monday, washing day, the yard would be full of lines of washing. I was glad we had a proper bathroom and toilet, although hot water was from a gas geyser and during the war we could not get it repaired, so the water was heated in a copper in the kitchen and carried up to the bath in buckets. On Saturday we had a dose of syrup of figs, cod liver oil, a hot bath, and we were clean inside and out for Sunday. At the bottom of the Bury Hill on the left hand side of the road was the Police Station (which now has been altered into Century House Flats). Further down on the corner of Bury Hill and Bury Road was Bury Mill (now a roundabout). Behind the mill was a large pond, and every year swans would nest on the banks of the river. In the spring we saw the cygnets hatch out, and change from gray into lovely white swans. Behind the Police Station was the police superintendent’s house and beyond that was the printing works, which printed our local newspaper, the Gazette (now flats are built there). Gadebridge Park started next as it does now, the only change is the fences and stiles have gone and the footpath is now Leighton Buzzard Road. 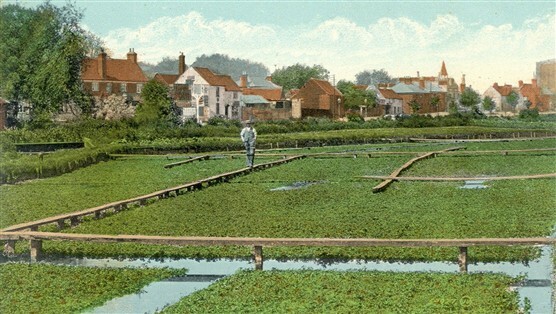 On the other side of the river were some watercress beds (now the bowling green and crazy golf course are there). As you went into Bury Road on the right hand side there were some houses, the Six Bells public house and Sid Williams newspaper and sweet shop and, in the back through a door, Sid Polard the barber conducted his business. 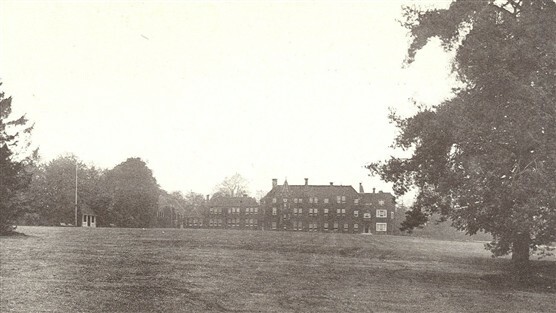 All these buildings and the cottages in Bury Hill were demolished. Today a grass verge and pavement cover the site but Sid Pollard went round the local hospital to cut the patients hair and took newspapers to the wards. On the opposite side of the road was Stainforth’s a grocers shop, the River Gade ran behind Stainforth’s, then came some small cottages. In the middle of the cottages was Charlie Knights fish shop (later Willis’ fish shop). At the end of the cottages was a right turning into Alma Road, continuing along Bury Road was Bill Brocket’s hardware shop (later moved to Old High Street), then there was Osborn and Tyres wholesale warehouse, Fred Oldfield the blacksmith was next. I would spend hours pulling the handle on the forge bellows, watching him turn red hot bars into horseshoes, and then shoeing the horses. After the blacksmiths was the cobblers, then the entrance to the Drill Hall. 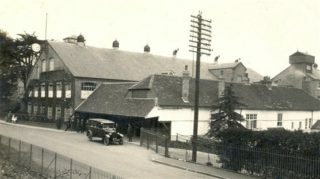 The backs of the RDC garages ran up to the Post House, which was the register and Rural District Council offices. On the ground floor of Bury Mill was Howard’s garage, owned by my great uncle. On the forecourt was a petrol pump, it had a manual handle, which you turned like a car starting handle, and would deliver the petrol through a hose to your car. Mr. Coleman’s cycle repair workshop was next to the garage, and a large house which was Miss Stella Clark School of Dancing. All these buildings were demolished to make way for Dacorum College and Leighton Buzzard Road. Still in Bury Road is the garage that Charlie Knight ran his Bream coaches from. The coaches ran a daily service between Bury Road and Apsley Mills morning, noon and evening for Apsley Mills workers. After the war Bream coaches ran Sunday day trips to Southend and Brighton. 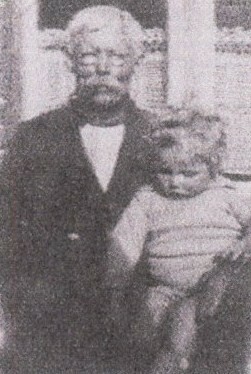 John Dickinson in the London Road was the largest employer in the town. Another industry was brush making at Kent’s Brush Factory, which still has a small building on the same site on the London Road. The London Paper Mill was at Frogmore. Roses Lime Juice wharf is now B and Q stores, Davis and Baileys made and sold agricultural implements in Marlowes. Cranstone’s Iron Foundry, also known as Phoenix’s Foundry, was behind the Old High Street. 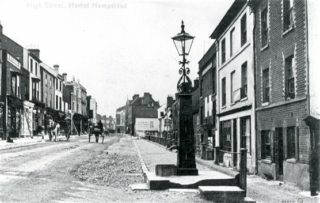 A pump with a gas light on top, now at the end of the Old High Street, and the drinking fountain with a gas light, now outside Boxmoor Hall, were made by Cranstone’s. They also made the white bridge in Gadebridge Park. Later Cranstone’s changed their name from Phoenix Foundry to Hemel Hempstead Iron Foundry and moved to Cupid Green In 1949. Brock’s Fireworks had a factory at Cupid Green with a lot of small wooden buildings in which the fireworks were made. 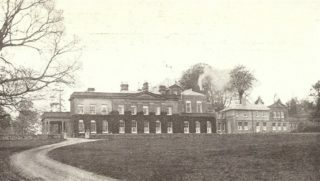 The site was spread over a large area, which is now known as Woodhall Farm. We also had a lot of watercress beds along the sides of the River Gade and River Bulbourn, plus lots of small farms in the area. A lot of workers also commuted to Harrow and London from Boxmoor Station, the station’s name was later changed to Hemel Hempstead Station, and the telephone exchange was altered from Boxmoor to Hemel Hempstead. Family life was different in the thirties; childhood illnesses were rife. My brother Stuart who was three years older than me, fell into the Bury Mill pond at the age of five and soon afterwards died of Diphtheria. In 1939 my sister Jean who was five years older than me had scarlet fever, and went into the Isolation Hospital. I was sent to live with my grandparents at Hammerfield, where I stayed for three months. I loved staying with my grandparents as my grandfather was a practical man, and I would sit with him in his shed, watching him repairing clocks, soldering pots and pans, even repairing shoes for the family. As a small boy I used to help my sister collect cowpats for dad’s garden from Gadebridge Park where farmers grazed their cows. One day we had collected a barrowful and on the way home when we got to the stile my sister lifted the barrow onto the top bar of the stile, told me to climb over and hold it while she climbed over, but I was unable to hold the weight above me and the lot fell on top of me. My sister tried to wash me in the nearby river then took me home, where my mother stripped me off and hosed me down in the back garden before I was allowed in the house. In 1935 the town celebrated the Silver Jubilee of King George V. All the children assembled at Boxmoor and paraded up Marlowes through the Old High Street into Gadebridge Park. I was three years old at the time and my sister was looking after me, being a boy I wandered off and got lost, only to be found much later sitting on the pavement outside the Heath Lane cemetery crying for my sister. During the war years we had several families of evacuees living with us. When there was an air raid we would be bedded down under the stairs of our house until it was over. One night we heard and felt the bombs dropping. 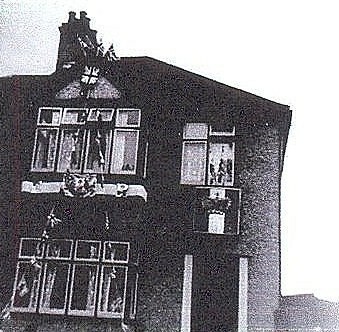 In the morning we went to school only to find a bomb had blown a house down in Astley Road and when I returned home at lunch time, I was told a house called The Orchard, which was 50 yards up Bury Hill from the Police Station, had also had been bombed. I left Bury Mill End School at the age of eleven. We had a choice of two schools: either The Grammar School in Heath Lane if you passed the eleven plus, or the secondary modern school, Crabtree Lane School, which I attended. 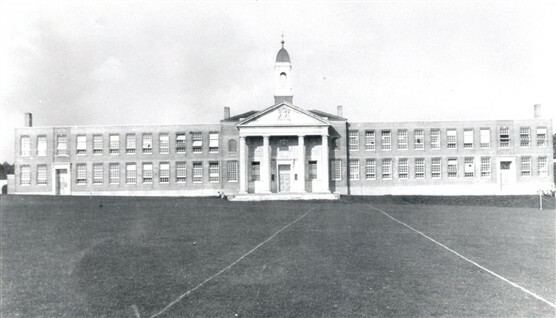 These were the only senior schools in Hemel Hempstead. 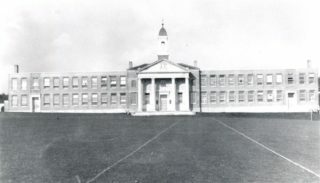 There were three public preparatory schools: Heath Brow School, Gadebridge School and Lockers Park School for Boys, which Earl Mountbatten had attended, and two for girls: St. Nicholas School and South Hill School. We had few sports in Hemel Hempstead. 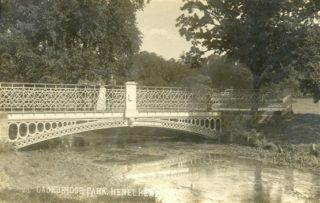 Hemel football field was in Crabtree Lane, on the moor at Heath Park was the cricket pitch and opposite St. Johns Church was Churchill’s, a large house, and in its grounds was an open air swimming pool. The entrance to the swimming pool was in Park Road. It opened in May and closed in September, the pool was not heated but we had a cold shower so it felt warm when diving in the pool. On the other side of St Johns Church across the moor was the old swimming pool surrounded by a corrugated iron fence. The pool was two large holes in the ground next to the canal and was filled by a pipe from the canal, very different from the new pool at Churchill’s. Shopping was very different when I was growing up during the war as everybody was issued with a ration book, and coupons were handed to the shopkeeper for an allotted amount of goods. The shop keepers sold most groceries by weight, weighing out sugar etc into brown paper bags. Butter was made into blocks with wooded butter pats with patterns on them. Cheese was also cut with a cheese wire to a size you required. The shop had a counter, which the shop assistant stood behind and served the customers. Albert Rose the milkman would deliver milk with his horse and cart; we would feed his horse while Albert was measuring out the milk from his milk churn into my mother’s jug. The Baker and Coalman also delivered bread and coal with a horse and cart. A short distance from Hemel Hempstead was the village of Bovingdon and an American Air Force Base was stationed there during the war. A lot of American air men came into the town from Bovingdon, and at Christmas held parties for the children. An event worth mentioning was the help given in the rescue of the casualties in the rail disaster of 1945 at Bourne End by the Americans; the train crash was seen by an American airplane flying overhead who gave the alert. Some of the first homes to be built after the war were the steel houses on the corner of Adeyfield Road and Leverstock Green Road, built for the returning service men and their families. Two of the new roads were named Montgomery Avenue and Tedder Road, after field marshals from the war. I left school at fourteen and I went to work for H G Gibbons and Sons at numbers 5 and 7 Alexandra Road, a plumbing, heating and electrical firm, as an apprentice. It had a shop at number 5 and offices at number 7 with large double doors between them; the doors led to a workshop at the rear. Over the shop and offices were two flats. Before Gibbons moved into number 7 the property was the second home for the Gazette Works, the first home for the Gazette being in Sun Yard off the Old High Street, the third being next to Gadebridge Park, with offices in an old house in Marlowes, then they moved to the present new offices in Marlowes. 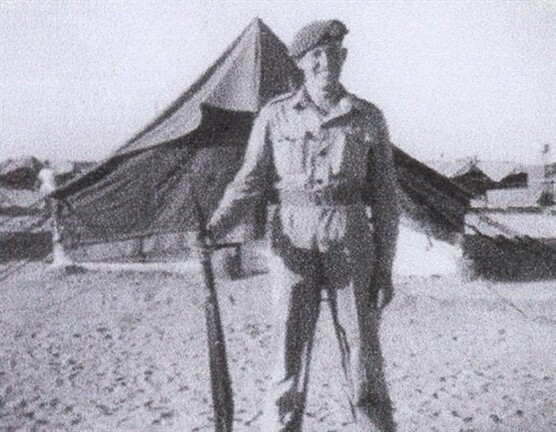 I left Gibbons for my National Service in June 1953. I served in the RAF and was posted to Egypt. On my return in June 1955 to Hemel Hempstead, I saw a big change. A lot of familiar buildings had disappeared and new buildings had been built. The old Hemel I knew had gone. This page was added on 15/11/2010.